Bouncing back and forth between projects this month is helping keep things fresh and the painting servitor has been operating at peak efficiency! Got a fair bit of brush time in over the last couple evenings and made some headway on the veterans, Maloghurst and the master of signal. Started off by giving the models an undercoat of 50/50 Black and USMC Tank Crew, to give the models a nice base for the green to highlight up from. Next up was a generous drybrush of straight USMC Tank Crew, concentrating a bit heavier on the upper surfaces. Maybe it's the year or so of painting nothing but reds but I gotta say, I really like this green! Time for the edge highlights! After the stylistic experiment of the recent Thousand Sons, I wanted to get back to my preferred style, and all the armor plates were picked out in USMC Tank Crew Highlight, again concentrating primarily on those edges and surfaces that were exposed to an overhead light source. Also roughed in the reds on the topknots and banner. The reds were given a wash and highlight pass, and then I went back and re-blacked all the weapons and shoulder pads which cleans up the models dramatically. The black was then given the initial highlight pass with a 50/50 mix of black and Sombre Grey. Starting to come together now! The second box o' joy arrived yesterday containing, among other things, some legion upgrade kits (shoulder pads, helmets, etc.) and I set to SoH-ing some event only models I've had kicking around for ages. 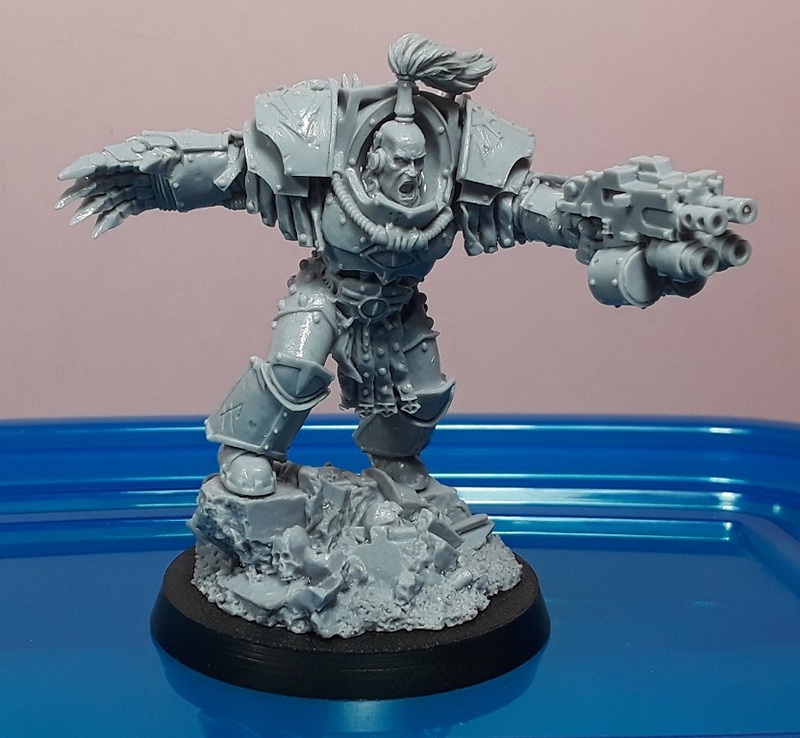 First up is a Primaris Medicae, in a Cataphractii variant suit of armor. He'll be joining the squad of lightning claw terminators planned for the force. 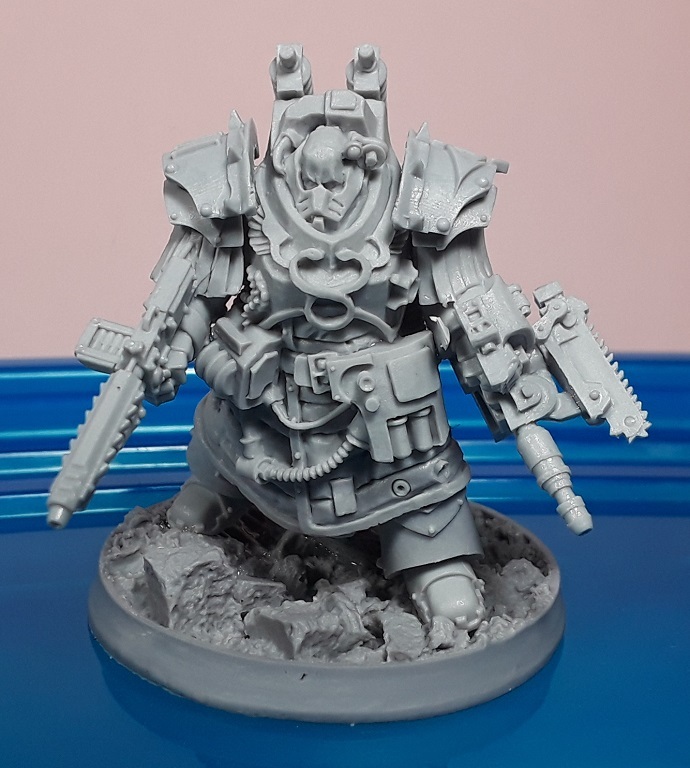 Next is a traitor terminator librarian. 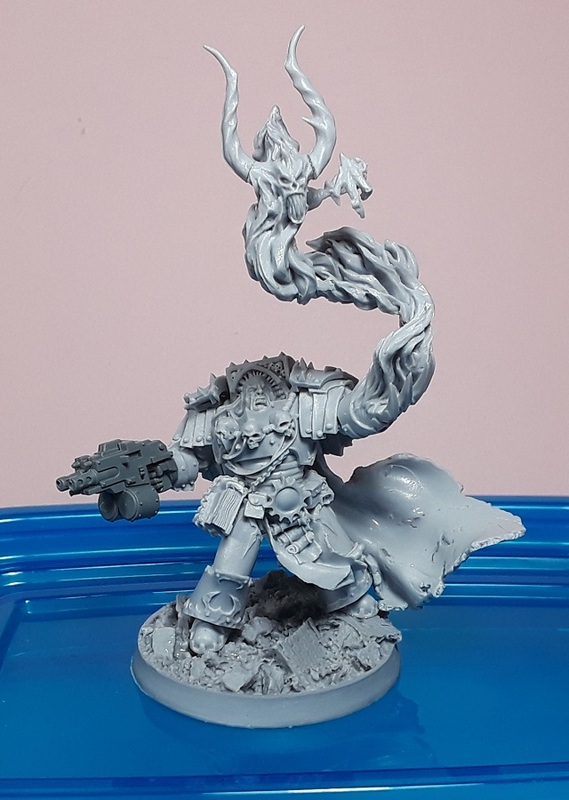 I didn't end up using him in the Thousand Sons army for obvious reasons, but he's gonna fit in fine with the Sons of Horus! Last but certainly not least is of course Ezekyle Abaddon, the not-quite-the-despoiler yet. 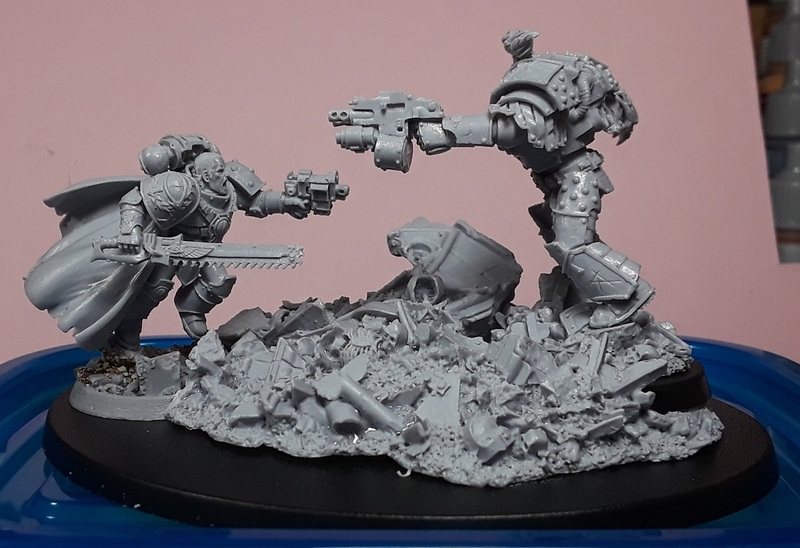 He'll be leading the big ol' squad of Justaerin Terminators, and will be transported to the fray either via teleportation or in the belly of a Spartan Assault Carrier. There's a model that I'm not particularly looking forward to assembling! 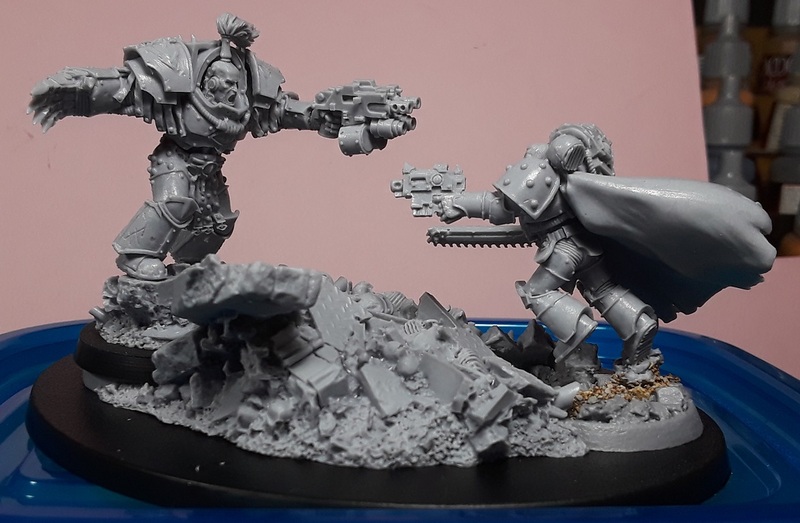 While I'm definitely going traitor with the force, I have always wanted to build and paint the Abaddon vs. Loken duel vignette, so there will be one loyalist when all is said and done! Blimey you have been busy! Looks fantastic, I know what you mean when you talk about painting a different colour for a change after painting an army solid for a length of time, the colours you're using for the SoH look really cool though, I think it's nice to paint an army using a colour you wouldn't normally go to every so often as well! So awesome Joel. Loving seeing the horus colors on your palette! OH, and you're doing Abaddon and Loken ?!?! How kool is that ? @Riot: Indeed, been in the zone recently! @Nick Thrower: Thanks man! Aye, switching it up from time to time really re-fires the engines! @Greg Hess: Thanks Greg! I'm digging the new scheme! 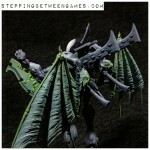 @Dai: Oh yes, the Warmaster will be making an appearance - He'll be in the third order. Thansk for the kind words, everyone! @Vitor: Thanks very much, man!